Scroll down this page for the Audition Packet!! 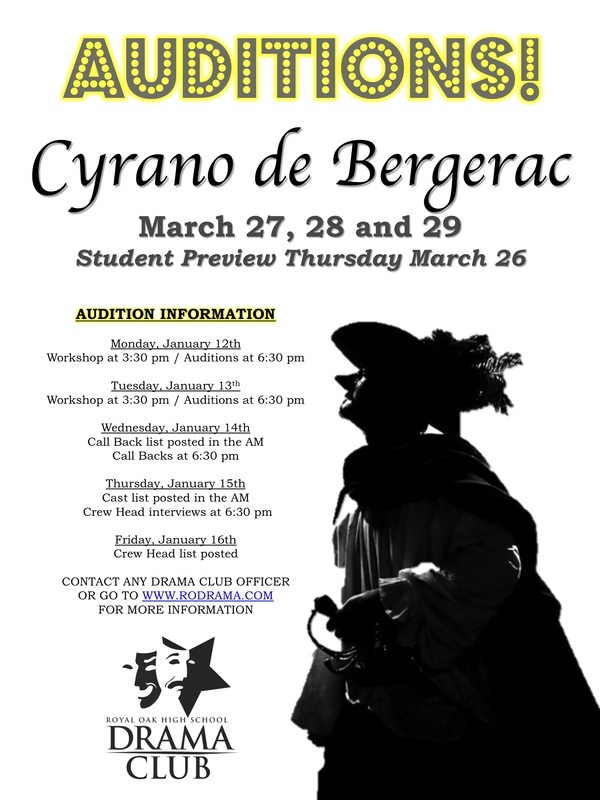 The audition process for Cyrano de Bergerac, the Royal Oak High School Drama Club spring theatrical production will begin right after the holiday break, so now is the time to get ready!! There are a lot of speaking roles in this play, male and female! Here is the Audition schedule. Click the button below to see the Student Contract for Cyrano de Bergerac so you will know what is expected of you and see the documents you will need to sign to participate. First, to all Drama Club students, I am exceedingly proud of the job you all did on Oklahoma! It was a real pleasure to see you all work so hard and perform so well (on and off stage), committed to making the best show you could. We all owe a big thanks to Mr. Molnar, Mrs. Buffa, Ms. Ward, Mr. Jensen, Miss Martin, Mr. Conrad, Ms. Shepherd-Bates and all the Boosters for their leadership. I hope you enjoy the photos, your memories and the friendships you formed. Right now I am reading 5 different translations of Cyrano De Bergerac to find just the right one for us. I am talking to a fight choreographer for the sword fights, and expecting Ms. Ward to work with us for the next show, too. Above you will find a button link to the "audition scenes" for you to read. Cyrano will audition January 5 and 6, with call backs on the 7th. Optional Workshops are planned for after-school on the 5th and 6th. The Cast list will be posted on the 8th (morning), and crew interviews will be the evening of the 8th. Anyone (even if already cast in the play) is welcome to interview for a crew leader spot. Our first "super" Saturday is the 10th: we really need to use that day to clean and organize everything in the shop and backstage. We also need to have costume and props "organization" meetings that day. Costumes and props for this show are going to be a challenge, as we do not have the kind of clothing we need in our stock and the pros are also historical. So we are seeking additional parental help in this regard. Rehearsals will begin the week of January 12th. I will work with the Boosters in advance to help construct a schedule that gives everyone a sense of consistency. But please remember that unexpected absences at scheduled rehearsals can be a real detriment to good planning. And note that crew leaders should attend rehearsals regularly to keep track of their part in the show's development. It is vital that we all spread the word about Cyrano, early and with enthusiasm, not just for ticket sales but for participation. It is not an easy play, but we don't do easy. I can assure you that it will be very rewarding show to do. It has some of the most famous and inspiring scenes in literature. This time we will need a larger stage crew, strong acting, students who are capable of physical combat (male and female), and I'd really like to see musicians and French speakers try out too! As always, I am willing to cast females in some male roles, especially the cadets. There is also live instrumental music onstage. I am asking Ms. Lundy to begin a dialogue with Mr. Jensen about that, as well as our and French and English teachers to see how they could use this show as a learning experience. The show performs March 27, 28 and 29, with preview on the 26th. I want to make sure that the entire middle school staff and students are invited to the preview on the 26th. I am excited that Frannie Shepherd-Bates is planning to return for the Student One Act Festival in the spring. I remind all students who are interested to begin their writing projects now. Officers should set a deadline for scripts earlier than in the past. I'd suggest the submission deadline be March 6. Frannie should be able to read your first drafts before you begin rehearsing your plays. Also, I think we could use more and earlier publicity efforts for the One-Act Festival this year. It is scheduled for April 24th. Officers: the Boosters and I are hoping you will plan ahead for the banquet, and consider all the other activities in which you and your fellow club members have to participate in the month of May. So, until January: Merry Christmas, Happy Hannukah and Happy New Year!